Kim Scheerer with a famous bosque porcupine. Kimi was a member of the Board for six years, and has been a strong champion, representing EEANM at meetings, conferences, and information tables. She has been Conference Chair and Co-Chair for our annual conference for at least three years in a row. She has boundless energy and has inspired thousands of children through her work with BEMP at Bosque School and throughout the state. She has presided over a period of organizational development where we developed policies and procedures that have increased the professionalism of the organization and the clarity of Board member responsibilities. 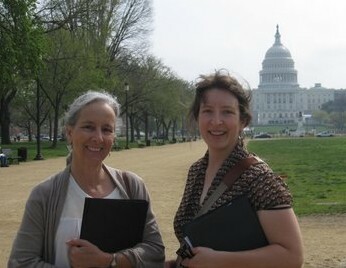 Barbara Garrity and Amy Landers visited DC to advocate for No Child Left Inside. Amy has been a member of the Board for four years, and has completely organized the financial accounting practices of the organization. She has worked with the Exec. Dir. to develop annual budgets, reports and transitioned the organization’s finances as we hired our first employee. She has put in hundreds of hours at her computer, mastering Quickbooks and entering data to keep us informed and aware of our financial status as we build the organization. She has help develop a board nomination process, other policies and forms to professionalize the organization. 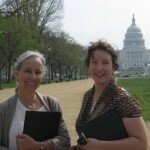 She has also helped with the EE Certification Program development and the Environmental Literacy Planning. Thanks to both of these outstanding Board members who contributed to the increased capacity of the organization over the past several years.